Hello everyone :o) I sat here for ages trying to decide on a post title, and then gave up... it's the trickiest bit about blogging sometimes! Glad its not just me that finds it hard Lisa. I am rubbish at thinking up a title. Love the card, The sentiment is gorgeous. This is gorgeous Lisa. I love that sentiment too and the way you have framed it is so beautiful. This is lovely. I really like the sentiment. Nicely done, love that sentiment! Thanks for playing our challenge! 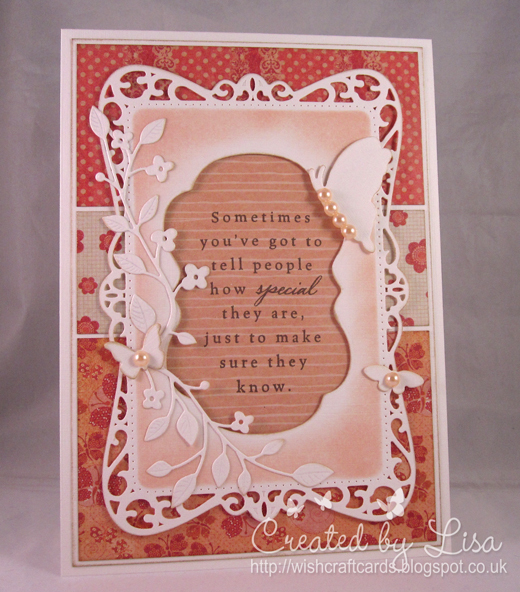 A beautiful card, such a lovely sentiment and gorgeous dies! Fab card honey. I love the lavish branch die. It's one of my faves. Completely love the gorgeous design of your card, the colors and the sentiment is fabulous!! Thank you so much for sharing it with us at 4 Crafty Chicks. Fantastic inspiration! Less is More - Jen's birthday! Pollycraft 1st challenge - anything goes! Sugar Nellie blog hop - Return to Fairy Glen!